Macmillan of Canada, 1987-01-01. Hardcover. New unread, excellent condition!. Satisfaction guaranteed. Macmillan of Canada, 1987-01-01. Hardcover. Very Good. 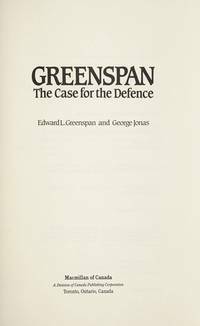 Signed by Edward L. Greenspan. Very minor shelf wear, otherwise excellent condition. Not remaindered. Not price-clipped. No writing or markings on pages. Binding is clean and tight with no loose pages. Perfectly readable and intact. Satisfaction guaranteed.